Archdeacon Roger ALLEY [Parents] was born in 1535 in Devon, Devonshire, England. He died in 1610 in , , England. Roger married UNKNOWN about 1558 in Devonshire, England. UNKNOWN was born about 1540 in Devonshire, England. She died about 1635 in Devonshire, England. UNKNOWN married Archdeacon Roger ALLEY about 1558 in Devonshire, England. M i Jeremiah Jerome ALLEY was born about 1560. He died in 1635. Nathan Edward LEABO was born on 11 Jun 1981. Nathan married Asia Marie PAYNE on 5 Mar 2005. Asia Marie PAYNE [Parents] was born on 24 Sep 1984 in Phoenix, Maricopa, Arizona. Asia married Nathan Edward LEABO on 5 Mar 2005. Carter Robert LEABO was born on 20 Sep 2005. 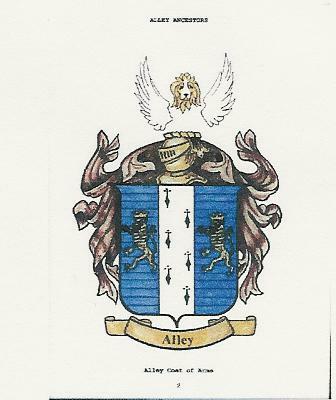 Sir John ALLEY [Parents] was born in 1460 in , , France. He died after 11 Aug 1506 in Greater Wycombe, Bucks, London, England. He was buried in Chapel of our Blessed Lady Wicombe, Wycombe, England. John married Agnes EMSON about 1485 in Buckinghamshire, England. Agnes EMSON was born in 1460 in Of Stratford-upon-Avon, Warwickshire, England. She died about 1525. Agnes married Sir John ALLEY about 1485 in Buckinghamshire, England. M i Mayor William ALLEY was born in 1487. He died on 15 Apr 1570. M ii Robert ALLEY was born in 1490. He died on 8 Dec 1542. Bishop William ALLEY [Parents] was born in 1510 in High Wycombe, Buckinghamshire, England. He died on 20 Apr 1570 in London, England. He was buried in The Choir of his Cathedral at Exeter, England. William married Sybil Bodleigh HONACOTT in 1534 in Devonshire, Devon, England. Sybil Bodleigh HONACOTT [Parents] was born in 1515 in Great Wycomb, Leicester, England. She died on 20 Apr 1570 in London, England. Sybil married Bishop William ALLEY in 1534 in Devonshire, Devon, England. M i Archdeacon Roger ALLEY was born in 1535. He died in 1610. M ii Jeremiah Jerome ALLEY was born in 1540. He died in 1635. Peter (Matthew) ALLEY was born on 12 Apr 1563 in Hamilton Church, Devon, England. He died in 1627 in Rea, Andrew, Missouri. Austin ALLEY was born in 1565 in Exeter, Devon, England. Richard DILLON. Richard married Sybil Bodleigh HONACOTT. Sybil Bodleigh HONACOTT [Parents] was born in 1515 in Great Wycomb, Leicester, England. She died on 20 Apr 1570 in London, England. Sybil married Richard DILLON. Jacob HENDRICKS [Parents] was born in 1812. James HENDRICKS was born in 1837. Robert ALLEY [Parents] was born in 1490 in Great Wycomb, Buckinghamshire, England. He died on 8 Dec 1542 in London, England. Robert married Christian about 1530 in London, England. Christian was born about 1494 in Great Wycomb, Buckingham, London, England. She died about 1545 in London, England. Christian married Robert ALLEY about 1530 in London, England. John ALLEY was born about 1530 in Great Wycomb, Buckinghamshire, England. He died about 1570 in London, England. Andrew ALLEY was born about 1535 in Great Wycomb, Buckinghamshire, England. He died about 1565 in London, England. James L. ALLEY "Sr" [Parents] was born in 1728 in , Henrico, Virginia. He died on 26 Mar 1799 in Russell, Virginia. James married Ashbury "Azby" CHRISTIAN about 1750 in , Henrico, Virginia. Ashbury "Azby" CHRISTIAN [Parents] was born in 1730 in Holland, Netherlands. She died on 10 Apr 1798 in Henrico Parish, Henrico, Virginia. Ashbury married James L. ALLEY "Sr" about 1750 in , Henrico, Virginia. F i Frances "Fannie" ALLEY was born in 1750. She died in Jul or Aug 1777 from Slain & Scalped by Indians . M ii James L. ALLEY "Jr" was born in 1753. He died on 2 Aug 1832. M iii Thomas Joseph ALLEY "Sr" was born in 1755. He died on 27 May 1834. M iv Rev. Peter ALLEY was born on 9 Feb 1757. He died on 9 Jan 1831. M v Hosea ALLEY was born in 1759. He died on 11 Jul 1824. F vi Mary "Polly" ALLEY was born in 1760/1762. She died in 1803. M vii Samuel Jay ALLEY "Sr" was born on 25 Jun 1761. He died on 12 Aug 1847. Jonathan (John) M. ALLEY was born on 8 Jul 1764 in , Henrico, Virginia. He died on 25 Aug 1841 in Metamora, Franklin, Indiana. Jane ALLEY was born in 1767 in , Henrico, Virginia. M x David K. ALLEY "Sr" was born in 1768. He died on 14 Nov 1838. F xi Elizabeth ALLEY was born in 1772. She died in 1843. Hannah ALLEY was born in 1775 in Washington, Virginia. Edmund ALLEY was born in 1777 in , Washington, Virginia. Cyrus ALLEY was born in 1779 in , Henrico, Virginia. Thomas Joseph ALLEY "Sr" [Parents] was born in 1755 in , Henrico, Virginia. He died on 27 May 1834 in Cinch Valley, Scott, Virginia. Thomas married Sarah Jane ALLEY in 1780 in Russell, Virginia. Sarah Jane ALLEY [Parents] was born in 1760 in , Franklin, Indiana. She died in 1804. Sarah married Thomas Joseph ALLEY "Sr" in 1780 in Russell, Virginia. Walter ALLEY was born in 1780. M ii Peter M. ALLEY was born in 1782. He died in 1859. M iii James ALLEY was born on 8 Dec 1783. He died on 29 Feb 1856. F iv Amelia Emily ALLEY was born in 1784. She died in 1850. F v Nancy ALLEY was born in 1786. She died after 1850. M vi Thomas Joseph ALLEY "Jr" was born in 1788. He died on 18 May 1864. M vii David Jesse ALLEY “Sr” was born on 6 Jun 1791. He died on 7 Jun 1834. M viii Abijah G. ALLEY was born in 1794. He died in 1865. F ix Mary ALLEY was born in 1796. She died about 1835. F x Fannie ALLEY was born in 1797. F xi Rachel ALLEY was born in 1802. She died in 1836. F xii Jane ALLEY was born in 1804. She died in 1835.